Western blot analysis of extracts of various cell lines using SIRT6 Polyclonal Antibody at 1:1000 dilution. IgG (H+L) at 1:10000 dilution. Lysates/proteins: 25ug per lane. Detection: ECL Basic Kit (RM00020). Exposure time: 30s. SIRT6 (sirtuin 6) is a protein coding gene that belongs to the sirtuin family. Sirtuns are a highly conserved NAD+-dependent deacetylases with various roles in metabolism, stress resistance, and aging. This protein has deacetylase activity towards Lys9 and Lys56 of histone H3. During the S-phase of the cell cycle, SIRT6 regulates acetylation of histone H3 in telomeric chromatin. It also deacetylates Lys9 of histone H3 at NF-kappa-B target promoters and can down-regulate the expression of a subset of NF-kappa-B target genes. SIRT6 is thought to be involved in normal telomere maintenance and in WRN (the factor that is mutated in Werner syndrome) with telomeres during S-phase. SIRT6 is required for genomic stability, normal IGF1 serum levels, and normal glucose homeostasis. It also regulates cellular senescence and apoptosis and the production of TNF protein. SIRT6 directly represses multiple glycolytic genes and functions as a corepressor of the transcription factor Hif1alpha. A shortage of SIRT6 increases glycolysis and lessens mitochondrial respiration. SIRT6 has a main role in regulating glucose homeostasis. 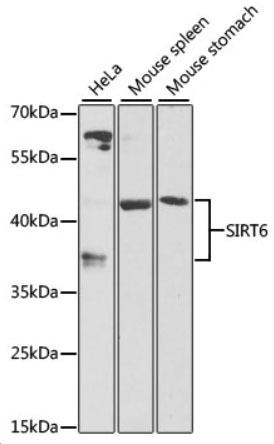 SIRT6 Polyclonal Antibody. Unconjugated. Raised in: Rabbit. Liquid. Buffer: PBS with 0.02% sodium azide, 50% glycerol, pH7.3.